The plate was destined to be collected and carried to the town's incinerator the same day. 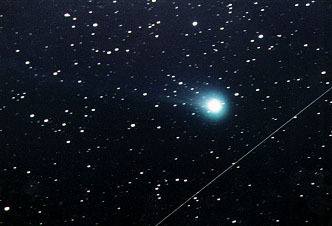 Mr. Tomita at Tokyo Observatory was not able to capture this comet because of the incorrect reported positions and moonlight. I reported my failure to Mr. Tomita, and after that I thought that this object did not actually exist. While I was attending to other matters, completely forgetting about this object, I received a phone call from Mr. Kamo that afternoon. He said that there were some errors in the position estimates but that he believed the discovery report to be reliable judging from Mr. Toba's achievement in tracking Comet Abe (1970g) to the faintest magnitudes. I remembered Mr. Toba's activity presented in the past publications and realized that he must have discovered something. Then, I rushed out to the collection point where my neighbors' rubbish was piled up. Luckily, the rubbish had not been collected yet. A fierce search begun to find the discarded plates. I didn't feel any embarrassment when digging into the rubbish because I was overwhelmed by my own stupidity and regret. Mr. Toba's success hinges upon my confirmation of the comet. What potentially fatal error of judgment have I made? It may sound overdramatic but the failure in retrieving the plate may have resulted in a discovery by other comet hunters overseas or the comet could have been lost forever like the object I discovered in 1951. When I think of it, it was a critical moment because it was near full moon and Mr. Toba himself was unable to track it. I shuddered at the thought of these possibilities. This memorable discovery photo was later presented to Mr. Toba. It may be still shining on his desk oblivious to the circumstances under which it was confirmed. Copyright (C) 1999 Tsutomu Seki.